The detailed accents and rich colors of this Premier twist promotional pen will get your message noticed! Enjoy undeniably smooth writing and unbeatable brand exposure with these MaxGlide Click corporate custom pens imprinted with your logo. Give your brand a professional look while going easy on the pocket book with the robust imprinted pen. 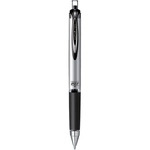 A stylish and professional custom pen that makes a wonderful addition to any executive desktop. Your logo will be spot on when imprinted on these ballpoint promotional pens that are available in a variety of bright sorbet colors.